Whipped up this easy and tasty caesar dressing the other day. It’s best if you let it sit and mellow for a day or two, but it’s perfectly good right away. If you want a milder garlic taste, use roasted garlic instead. 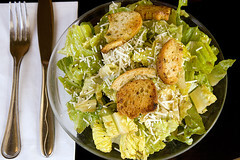 Pour over coarsely chopped Romaine lettuce, add black pepper, parmesan cheese and croutons. Repeat as necessary. It’s springtime, so it’s time for fingerling potatoes and green onions, both of which make for a tasty and healthy potato salad! Boil up 2 lbs fingerling potatoes (cut into bite-sized chunks) for about 10 minutes, drain, and soak in cool water. You can eat this immediately, or let it sit in the fridge for about a day to allow the flavors to blend nicely. I also forgot to put in some green onions (also fresh from the Farmers’ Market) and some mushrooms. Ranch dressing is one of those things that is easy to make, yet it’s something folks buy premade at the store. Here’s a quick recipe that uses no unpronounceable or questionable ingredients. It’s adapted from this recipe. Units listed are proportional parts. For a single batch of dressing, 1 part = 1/8 teaspoon and yields 1 tablespoon of seasoning mix for 1 pint of dressing. To make a large batch for use later, 1 part = 1/8 cup (2 tablespoons) and makes 1.5 cups of mix, enough for 24 batches (1.5 gallons) of dressing. You can also use this seasoning mixed with bread crumbs for breading chicken. Take about 3 lbs of sweet potatoes (or just one, see my previous post) and cut into approximately 3/4″ cubes. Plop them in a l arge pot of boiling water and boil until tender but firm (8 minutes was a little too long and they ended up a little soft). Drain and rinse in cold water to stop the cooking process. Set aside to cool for a while (in the fridge if you have room). Ma ke a dressing consisting of 1/3 cup extra virgin olive oil, 2/3 cup apple cider vinegar. Add 1/2 teaspoon of salt and 2 tablespoons chopped fresh garlic. Add 1/2 tablespoon honey (raw if you can get it) or a comparable amount of stevia and shake well. The original recipe for this calls for tossing it with a french-type dressing. I’m rather partial to Annie’s Naturals Roasted Red Pepper Vinaigrette (which is good on all kinds of things), but had to get creative this go around since Blaine’s food plan specifically says no canola oil. Add the chopped stuff to the cubed sweet potatoes and toss with the dressing. Let it mellow for a little while in the fridge, and then enjoy with a friend or several. Update: Sadly, Blaine lost his battle with cancer shortly before Thanksgiving of 2007. He is deeply missed by all who knew him.